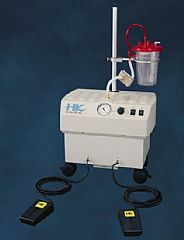 The HK Surgical state of the art Aspirator offers superior high speed powered suction performance. It can accommodate up to 5 Baxter Canisters or 2 Abbott/Sorenson Canisters, eliminating time consuming canister changes. The HK Surgical Aspirator is designed for powerful performance with minimal noise. It is unquestionably the best aspirator on the market. Vacuum adjustable from 0 to 29.5 Hg at sea level and standard conditions. Flow rate is 3 cfm free air, at sea level and standard conditions. No flow restrictions at intake. Dimensions: 19" x 13.5" x 16" Approximately 50 lbs. Limited 5 year warranty on all parts and labor.